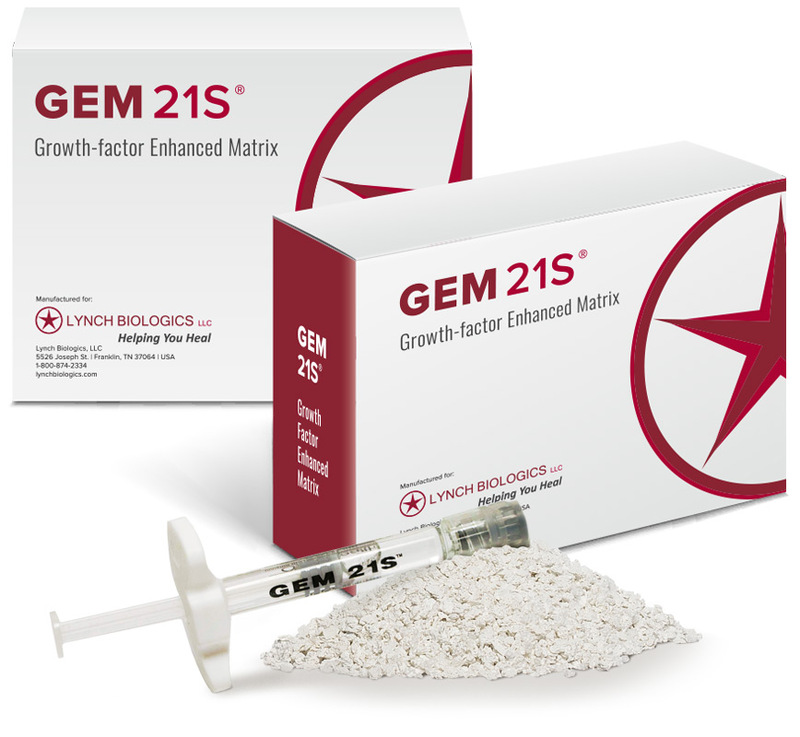 GEM 21S® growth-factor enhanced matrix is indicated to treat the following periodontally related defects: intrabony periodontal defects; furcation periodontal defects; and gingival recession associated with periodontal defects. GEM 21S® growth-factor enhanced matrix combines a bioactive protein – highly purified rhPDGF-BB – with an osteoconductive matrix, ß-TCP. GEM 21S® is the only dental therapy containing rhPDGF-BB, one of the main growth factors found in the human body and well known for its stimulatory role in wound healing. At LBIO we are solely focused on bringing you the best available biologic products to promote healing and regeneration to your patients. 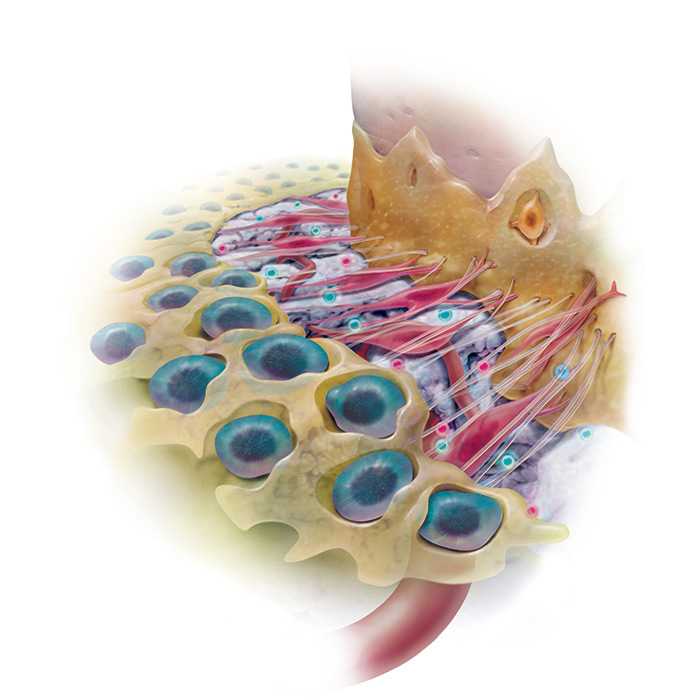 GEM 21S® Growth-factor Enhanced Matrix was developed utilizing innovative tissue engineering principles which combine a bioactive protein (highly purified recombinant human platelet-derived growth factor, rhPDGF-BB) with an osteoconductive matrix (beta tricalcium phosphate, β-TCP). 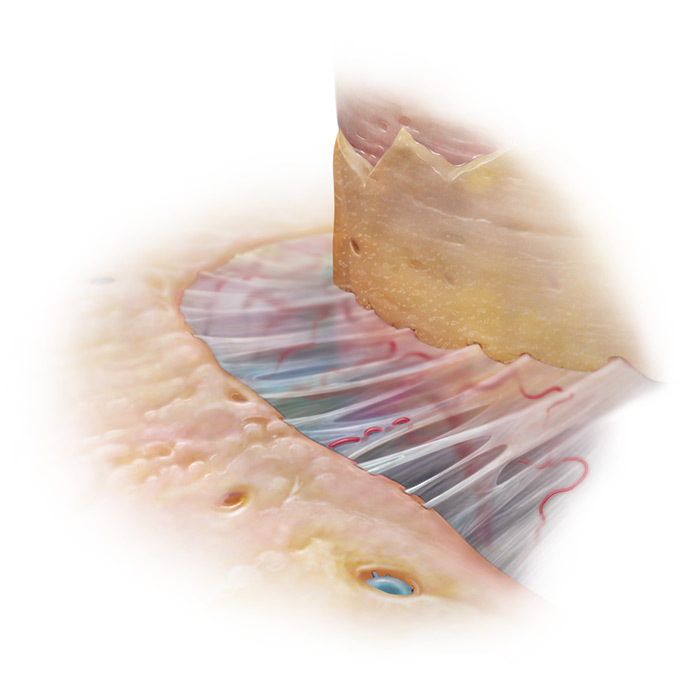 This completely synthetic grafting system is engineered to stimulate wound healing and bone regeneration when implanted in the body by triggering a cascade of molecular events that continues on even after the implanted rhPDGF-BB is gone. rhPDGF-BB is released from the β-TCP matrix into the surrounding environment. rhPDGF-BB then binds to specific cell surface receptors on target cells, initiating a cascade of intracellular signaling pathways. 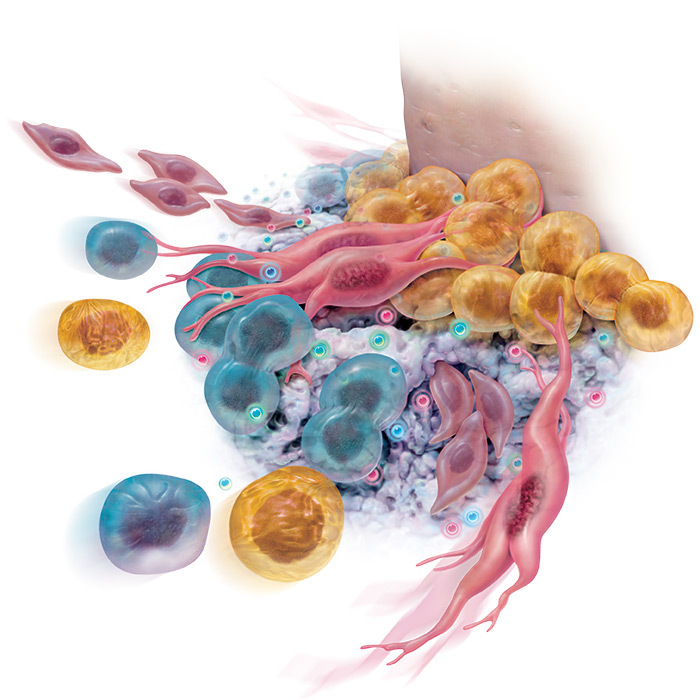 Proliferation of osteoblasts, periodontal ligament fibroblasts and cementoblasts leads to increased matrix synthesis, resulting in formation of new alveolar bone, periodontal ligament and cementum. * Angiogenesis (blood vessel formation) continues. Clinical data suggests that over time (approximately 6 months), maturation of supporting alveolar bone, cementum, and periodontal ligament occurs. The end result is enhanced bone and periodontal regeneration and retention of the natural tooth. *Based on in-vitro and in-vivo data. Wang HL, Pappert TD. Castelli WA, Chiego DJ Jr., Shyr Y, Smith BA, The Effect of Platelet-Derived Growth Factor on the Cellular Response of the Periodontium: An Autogradiographic Study on Dogs. J Periodontal. 1994 May; 65 (5): 429-36. Graves DT. The Use of Biologic Response Modifiers in Human Clinical Trials. Ann Periodontol. 1997; 2: 259-267. Piche JE, Graves DT. Study of the Growth Factor Requirements of Human Bone-Derived Cells: a Comparison with Human Fibroblasts. Bone. 1989; 10(2): 131-189. Nevins M, Giannobile WV, McGuire MK, Kao RT, Mellonig JT, Hinrichs JE, McAllister BS, Murphy KS, McClain PK, Nevins ML, Paque e DW, Han TJ, Reddy MS, Lavin PT, Genco RJ, Lynch SE. Platelet Derived Growth Factor (rhPDGF-BB) Stimulates Bone Fill and Rate of Attachment Level Gain. 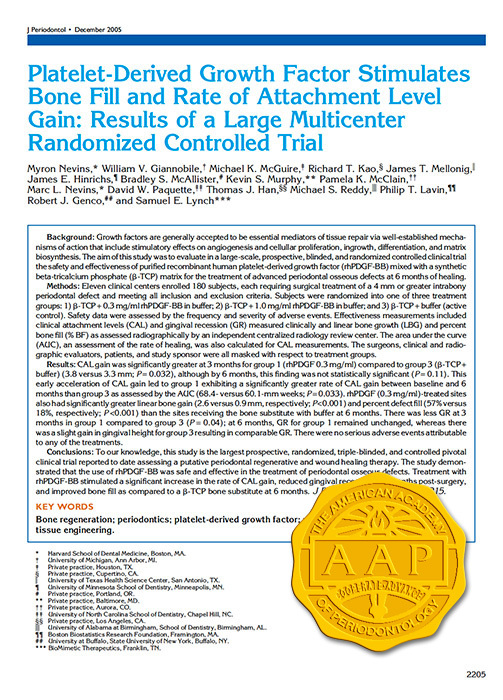 Results of a Large Multicenter Randomized Controlled Trial. J Periodontol., 2005; 76: 2205-2215.
and William V. Giannobile. 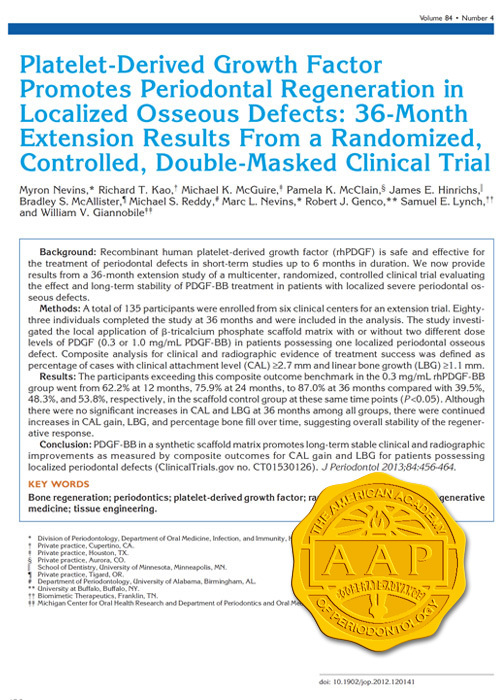 Platelet-Derived Growth Factor Promotes Periodontal Regeneration in Localized Osseous Defects: 36-Month Extension Results From a Randomized, Controlled, Double-Masked Clinical Trial. J Periodontol., 2013; 84: 456-464. This award is presented by the AAP Foundation. This award recognizes an outstanding recent scientific article about periodontal regeneration in the basic and clinical sciences. 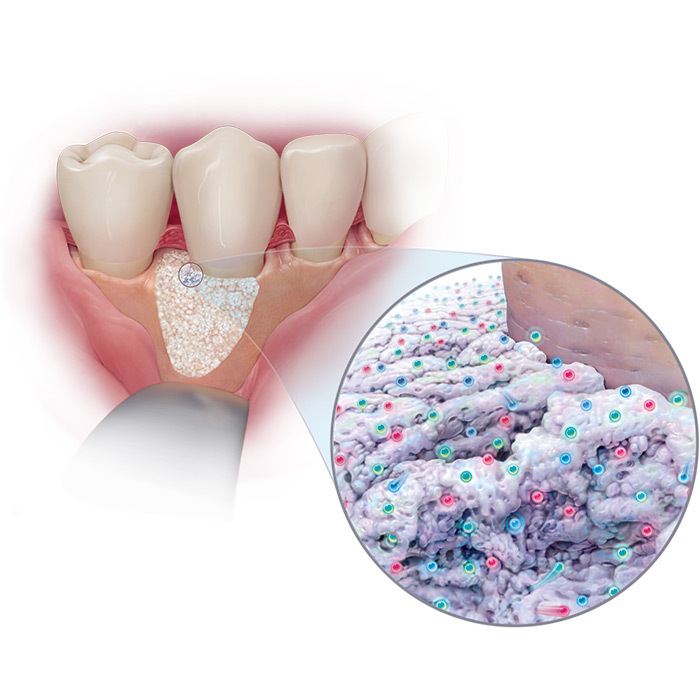 As with any periodontal procedure where bone grafting material is used, GEM 21S® is CONTRAINDICATED in the presence of one or more of the following clinical situations: untreated acute infections at the surgical site; untreated malignant neoplasm(s) at the surgical site; patients with a known hypersensitivity to any product component (ß-TCP or rhPDGF-BB); intraoperative soft tissue coverage is required for a given surgical procedure but such coverage is not possible; or conditions in which general bone grafting is not advisable. 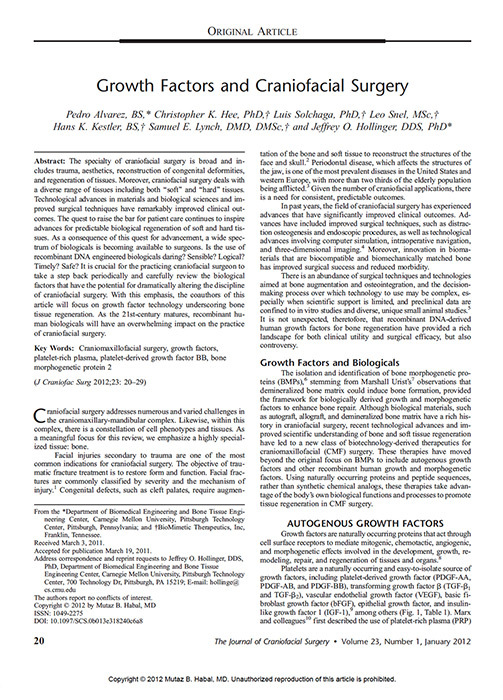 The safety and effectiveness of GEM 21S® has not been established: In patients with an active malignant neoplasm and should therefore not be used in such patients; in other non-periodontal bony locations, including other tissues of the oral and craniofacial region such as bone graft sites, tooth extraction sites, bone cavities after cystectomy, and bone defects resulting from traumatic or pathological origin. GEM 21S® has also not been studied in situations where it would be AUGMENTing autogenous bone and other bone grafting materials; in pregnant and nursing women. It is not known whether rhPDGF-BB is excreted in the milk of nursing women; in pediatric patients below the age of 18 years; in patients with teeth exhibiting mobility of greater than Grade II or a Class III furcation; in patients with frequent or excessive use of tobacco products. Careful consideration should be given to alternative therapies prior to performing bone grafting in patients: who have severe endocrine-induced bone diseases (e.g. hyperparathyroidism); who are receiving immunosuppressive therapy; or who have known conditions that may lead to bleeding complications (e.g. hemophilia). The GEM 21S® grafting material is intended to be placed into periodontally related defects. It must not be injected systemically. The radiopacity of GEM 21S® is comparable to that of bone and diminishes as GEM 21S® is resorbed. The radiopacity of GEM 21S® must be considered when evaluating radiographs as it may mask underlying pathological conditions. An increased rate of mortality secondary to malignancy with use of high quantities (i.e. 3 or more tubes of REGRANEX® Gel) was demonstrated in a single study of its use in treatment of diabetic, neuropathic ulcers. Two subsequent studies did not demonstrate this increased rate. No relationship has been demonstrated regarding use of rhPDGF-BB in periodontal defects and malignancy or mortality secondary to malignancy. Although no serious adverse reactions attributable to GEM 21S® were reported in a 180 patient clinical trial, patients being treated with GEM 21S® may experience any of the following adverse events that have been reported in the literature with regard to periodontal surgical grafting procedures: swelling; pain; bleeding; hematoma; dizziness; fainting; difficulty breathing, eating, or speaking; sinusitis; headaches; increased tooth mobility; superficial or deep wound infection; cellulitis; wound dehiscence; neuralgia and loss of sensation locally and peripherally; and, anaphylaxis. Occurrence of one or more of these conditions may require an additional surgical procedure and may also require removal of the grafting material.